By Master Gurjot K. Singh, M Ed. 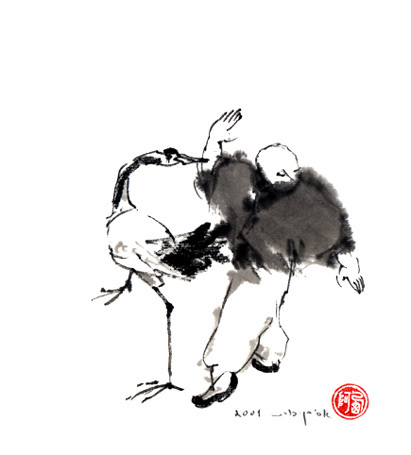 In our series, Illusive Pugilism: Merging the 13 Postures of Tai Chi Ch'uan with Western Methods of Fighting, we introduced readers to the integration of the thirteen strategies of Tai Chi Ch'uan with western boxing, kickboxing and grappling. We discussed, in depth, the nature and use of the five steps (metal, wood, earth, fire, and water). Subsequent articles discussed the ward-off, roll-back, press and push strategies and their accompanying energies. This information is the foundation for the strategies that will be explored in this article. When you unbalance an opponent you create the the opportunity to strike. For an aggressive opponent using the Metal or Fire step (For further reference on words in bold letters, see the first article.) sometimes striking causes a loss in an opponent’s structural soundness. This makes the opponent lose intrinsic strength, allowing uprooting or unbalancing to occur. 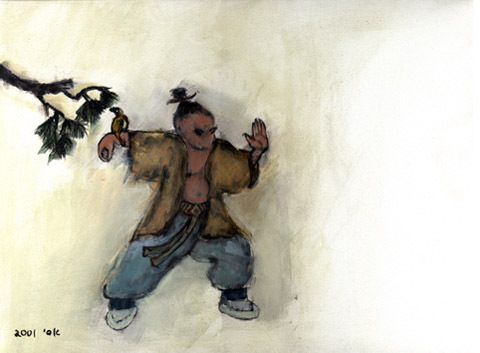 The split and twist (Lieh) and the grasp and pluck (T'sai) are uprooting strategies that can proceed or preceed strikes. All the the strategies mentioned are invaluable when their form is applied to Mixed Martial Arts (MMA) sparring or fighting. Grand Master Liu Xi Wen, Yang Shou Hou Lineage, presents one of the best classic Tai Chi Ch’uan demonstrations of T'sai and Lieh that an adept can observe. In his Push-hands demonstration he begins by demonstrating the first four strategies and then a minute and twenty seconds later enters the splitting and grasping strategies in the earth step. After a minute and twenty-nine seconds he begins using the wood, water, and fire steps to execute a T'sai strategy and spirals the opponent. At two minutes and fourteen seconds he begins splitting the guard of the opponent while executing the Metal step, then combines Lieh with T'sai and An (Pushing) to put the opponent on the floor. Intrinsic strength of posture and body structuring allows the master to follow the intent of the opponent in the beginning of the presentation until the opponent is controlled. In other words his defense is so solid he can afford to allow the opponent to be attracted into emptiness as he follows, links, adheres, sticks, never resists, and never releases: Wu Xing or the Five Powers (or Five Energies). Push-hands allow us to learn about others; however, the structure that allows him to surrender intent in this fashion comes from his knowledge of self. The master’s presentation of the Yang Shou Hou Small-Frame Form is masterfully performed. His performance indicates to the practiced eye how important Sung (sinking) or footwork is to the MMA practitioner concerning standup and clinching scenarios. His close-footed or small-frame stance is immovable because he is sunk while shifting substantially and insubstantially. Tire-weight training, Bagua movement training, Wing Chun wooden dummy drills and the western boxing two-ended bag must be added to Tai Chi Push-hands training when striking and takedowns are added to the sparring exercise. Inside wrist: Between brachioradilis and flexor muscles of the fingers. An attack to this point produces trauma to the underlying nerve and artery, leading to an unusual type of pain that affects the chest and throat regions and causes the loss of motor functions and the loss of consciousness. Upper arm, dorsal surface: The middle part between the bicep and triceps. The cause of the loss of consciousness is trauma to the ulna and median nerves and blood vessels of the upper arm. This produces an unusual type of pain in the chest and neck and also the loss of motor functions. Lateral surface of the elbow: The cause of the loss of consciousness is trauma to the ulna nerve, producing an unusual type of pain in the chest and neck also causing the loss of motor functions. Dorsal surface of the wrist: The space between the ends of the radius and ulna. The cause of the loss of consciousness is trauma to the median nerve and the loss of motor functions. The next article is this series will discuss the strategies of the elbow and shoulder strike. We also will discuss the application of Emitting Energy (Fa Chin), Short Energy (Duan Chin), and Long Energy (Chang Chin), as they apply to these strikes. Simply stated: The system works because the fighter has the heart to persevere in a training regimen that mentally, emotionally, and physically prepares them for the opponent they can’t beat… Not the one they can!